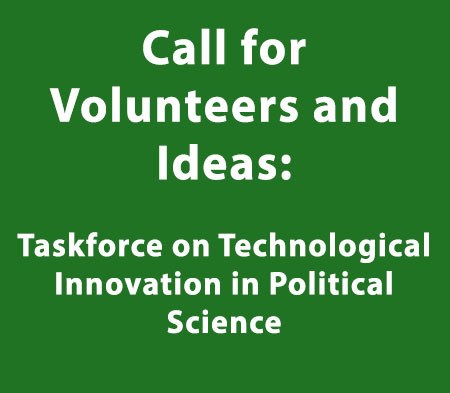 The 2015-17 APSA presidential taskforce will focus on enhancing political scientists’ capacity to develop and use technological innovations in their research, teaching, and public engagement. It will begin with two main foci, although of course task force members may expand or change these foci as they do their work. One goal is to bring together technological innovations already taking place within political science, in a way that makes them accessible and valuable to a wide range of users. The other goal is to create new technological tools and concepts that respond to scholars’ and students’ expressed needs, or that will spark new ways to study, teach, and communicate. For these and any other foci, it will be essential to set up a system for maintaining innovations after the task force has completed its work; that will entail working closely with APSA staff who are themselves innovating technologically. On the first goal: many of us know of colleagues or groups that are creating new teaching tools, simulations, blogs, interactive websites, graphic displays, maps, data repositories, platforms for replication, etc. We may be developing these ourselves, and passing them on to interested groups or individuals. But as a discipline, we lack a central repository, easy means of discovering what other scholars are doing, and ways to modify or expand on an existing tool or simulation. The APSA is developing a new website that can be the home for many of these innovations; what is needed is a way to organize the material that political scientists provide, ensure accessibility and ease of use, bring users into contact with one another, and encourage further innovation. This is at least as much an intellectual and scholarly task as an organizational or technical one—and the task force can think through how best to take advantage of work already underway but underused. An interactive review site, perhaps a wiki, in which people could post informal reviews of books, articles, archives, museum exhibits, film, political events, legislative hearings, court decisions, sermons, speeches, websites, databases, or any other material that is useful for the study of political science. In my view, the reviews should not be anonymous, and the site would need a moderator (with a light touch) to keep the tone scholarly and constructive. A platform for crowdsourcing scattered but valuable information in which particular forms of lay expertise can be harnessed. Examples include details of local elections in various countries, the nature of protests or other spontaneous political activity, and community deliberations. Short modules (perhaps stand-alone 10 to 30 minute lectures or demonstrations) that can be used in courses – ranging from a substantive discussion of a political phenomenon or institution, to a methodological demonstration such as how to use GIS, a simulation, a demonstration of how to conduct a face-to-face survey or interview, an analysis of how different translations of an important passage changes a political philosophical argument, a demonstration of how to use an archive or artistic product for purposes of political science, or anything else that might enliven and deepen classroom discussions. Interview templates, preferably annotated, that can be adopted and modified for use in particular settings or for particular purposes. For example, a set of interview questions that were effective with Muslim women in Indonesia might be useful, mutatis mutandis, with village leaders in Peru or undocumented migrants in Los Angeles. A template for interviewing informants will differ in important ways from a template for interviewing respondents. Interactive websites in which students make political or policy decisions, analogous to the New York Times’ budget game (http://www.nytimes.com/interactive/2010/11/13/weekinreview/deficits-graphic.html?scp=1&sq=fix%20the%20deficit&st=cse), which received at least 11,000 twitter responses and a million page downloads. Taskforce members will have their own ideas for innovations. The taskforce will consist of 10 to 12 members, chosen from a range of subfields, types of institution, methodological and epistemological preferences, and demographic characteristics. We invite nominations, including self-nominations; please send a brief (no more than 300 word) statement explaining your interest and relevant experience, and a c.v. no longer than 5 pages. We also welcome ideas for technological innovations or information about an innovation that you or colleagues have developed. These notes will be passed onto the task force for its use over the next two years. The deadline for nominations is August 14, 2015. There is no deadline for good ideas or information.